If fast food causes obesity, is it possible to eat fast food AND lose weight? Low calorie food is abundant in fast food restaurants, but calories are not your only consideration. When you reduce fat you always reduce calories. A teaspoon of butter contains 36 calories. Keep in mind, butter has more than twice the calories of sugar! Fat is more fattening than sugar. Unfortunately when you reduce the fat content of a food item, the sodium content almost always increases. Low calorie foods are infamous for high sodium content. Why worry about high sodium levels? What good does it do to reduce calories and fat if you retain so much water you bloat and your fingers are so swollen you can't get your rings off? Salt and sodium are prime causes of water retention, which makes losing weight difficult. Plus, too much salt has been associated with high blood pressure which may lead to several dangerous ailments. All smart, low calorie fast food lunch ideas should reduce fat, calories and SODIUM to a reasonable amount. BEWARE SALT AND SODIUM. Go to www.bd.com for a free copy of BD Getting Started Fast Food Guide, a handy 56 page print out of the nutrition breakdown of many popular fast food chains and featured low calorie foods. I keep a copy in the car and consult it often. Or go to your restaurant's web site for low calorie fast food nutritional information. You can also check for coupons and save a couple bucks while you're there. Make a habit of eating only low calorie foods at your favorite restaurants and you can dramatically improve nutrition and lose weight. Low Calorie Fast Food Tip #1 -- Most calories come in the form of fat. Reduce fat and automatically reduce calories. Look for lots of fat in cheese, mayonnaise, salad dressing, large portions of meat, bacon, cream sauces, gravies and fried items. Order a hamburger instead of a cheeseburger, use half the dressing on your salad, hold the mayonnaise and pickles and make a big impact on the quality of your diet as well as reduce calories. Low Calorie Fast Food Tip #2 -- A salad is not usually the best choice. You might assume it would be better for you but many have more calories, fat and sodium than a double cheeseburger with fries. I don’t recommend using salad dressing labeled “low fat” or “fat free” because of the long list of foreign ingredients, much higher sodium content (higher than fries! ), and the taste. Use less of a “regular” dressing to shave calories, fat and salt. Unless you like dry salads, then use no dressing and enjoy! Low Calorie Fast Food Tip #3 -- The USDA recommends 2,300 mg of sodium per day for healthy adults; 1,500 mg for older folks, African-Americans and people with high blood pressure. Low Calorie Fast Food Tip #4 -- There are several strategies you can use to reduce calories, fat and sodium. You can scour the nutrition data on your favorite fast food restaurants. Figure out a few good options in advance so you know what to order. Or, eat 25% less of your favorite burger to eliminate 25% of the calories, fat and sodium content. Order without mayonnaise, cheese and pickles to further reduce calories, fat and sodium. 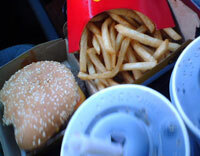 Low Calorie Fast Food Tip #5 -- Order a la carte, avoid value meals. You’ll get exactly what you want and save money as well. McDonald’s hamburger, small fries and small iced tea is under $3 where I live. See Portion Perversions for more about portion sizes in restaurants and fast food joints. Here's a list of several fast food restaurants and sensible low calorie fast food selections. When you see menu items highlighted in yellow, it represents Best Low Calorie Sandwich for that restaurant. Order your Whopper without mayonnaise or cheese and knock off 250 calories. Whopper Jr. with Mayo is 330 calories less than a regular Whopper with Mayo. (1 slice) Medium Thin ‘n Crispy Pepperoni Pizza (210 calories, 10 grams of fat, 640 mg sodium) Two pieces of pizza have 1280 mg of sodium, nearly a day’s allotment for some people. Reduce calories by using low fat or nonfat milk in your lattes and cappuccino. Or get a smaller size than normal. You could also switch to espresso where you get your caffeine without sodium, fat or calories. Many of their sandwiches are good choices if you look at calories, but you can easily get 2/3 of your recommended sodium intake from one sandwich. Especially the ones with less than 6 grams of fat and toasted sandwiches. One crunchy taco has 170 calories, 10 grams of fat and 350 mg of sodium. I never eat just one. Two crunchy tacos contain 340 calories, 20 grams of fat (65 grams or less is recommended for adults by the USDA) and 700 mg of sodium. Taco Bell has also added a Fresco Menu featuring items with 9 grams of fat or less and 70 calories or less. Of these Fresco items, Crunchy Taco, Soft Taco Beef and Grilled Steak Soft Taco have less than 700 mg of sodium. The Crunchy Taco has 350 mg sodium. Use caution, two of these items, while not bad calorie wise, increases sodium. I think you come out better on the regular menu all the way around. For more interesting healthy lunch ideas and low calorie sandwiches visit Sandwich Solutions on this web site. Healthy brown bag low calorie lunch ideas including 12 Easy Diet Lunch Tips and Hints & Shortcuts can be found here. and leave Low Calorie Fast Food page.